Welcome to the FREE Residential Rooftop Report for the first quarter of 2018. This edition is brought to you by SolarRoofHook. 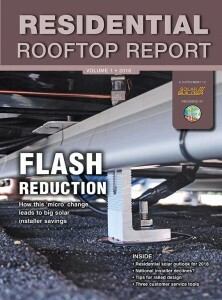 In this free downloadable report, we have pulled in insight from the pages of Solar Builder magazine and from the experts at SolarRoofHook to provide a fresh, quick read covering residential solar trends and some installation best practices. Just fill out the form below to access your free report.